Meeting of the Minds took a few moments to talk with Herrie Schalekamp about new working relationships between researchers and paratransit operators in South Africa and beyond. Herrie is the ACET Research Officer at the University of Cape Town’s Centre for Transport Studies. Since 2008 he has been involved at the Centre in research, teaching and management. In 2015 he obtained his PhD degree at UCT, and he also holds the degrees of MPhil (Transport Studies), BArch and BAS. In addition to his research, teaching and consulting in the fields of paratransit and public transport reform he is involved in specialised educational programmes for paratransit operators and government officials. Herrie’s activities form part of a broader endeavour to investigate and contribute to improved public transport operations and regulation in Sub-Saharan African cities under ACET – the African Centre of Excellence for Studies in Public and Non-motorised Transport. How did your work in the paratransit sector emerge? In partnership with the Universities of Dar es Salaam and Nairobi, the University of Cape Town received a VREF grant in 2008 to set up the African Centre of Excellence for Studies in Public and Non-motorised Transport (ACET). I’ve been part of the management team at ACET and also completed my PhD on the business aspirations of paratransit operators, which are those who run unscheduled minibus services. I looked at how they saw themselves as business people, how they responded to the bus rapid transit (BRT) project here in Cape Town, and what their aspirations were in terms of improving their businesses. This was part of a larger project at ACET looking into the existing structuring of paratransit businesses. There had been little locally grounded empirical research on paratransit operations before that. Since 2015, I’ve been convening short courses for people in the paratransit industry on running a professional service. Topics include fleet management, human resource management, contracting, labour law, and whatever we collectively come up with between the operators, consultants, municipality, and us at the university. It’s hands-on work amongst operators to help them figure out how they can deal with transport reform and potentially start driving it themselves without waiting for government to intervene. It’s been quite amazing to see how positively they have responded to us and wanted to collaborate in our research. 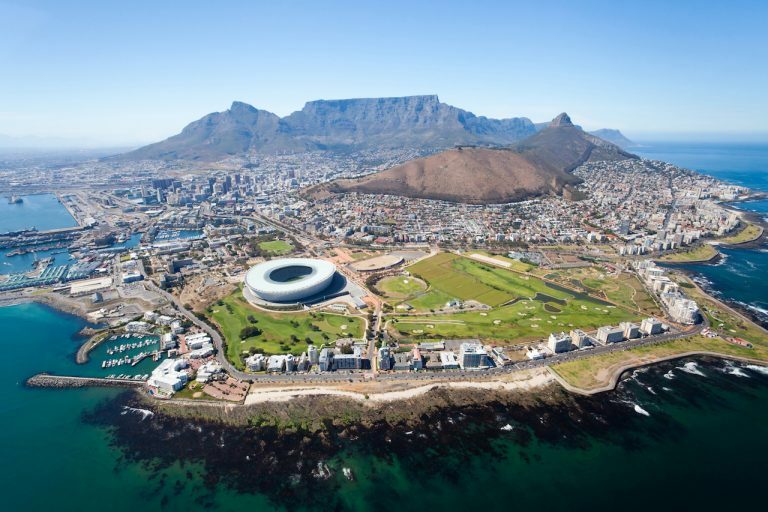 Why was change needed to unscheduled paratransit services in Cape Town? In preparation for South Africa to host the 2010 FIFA World Cup, the national government put a lot of effort and funding into finding a silver bullet to resolve all our public transport issues. So the BRT model was imported quickly from South America and there wasn’t a lot of time to consult or test different ideas. It soon became clear that the existing paratransit operators didn’t understand their role in the new BRT services. This created a huge social transition challenge. It required the operators to move out of their day-to-day small-scale cash-based operations and combine into bigger entities. The press captured the operators’ protests but not their aspirations or needs, so the media story became all about the bad relationship between government and paratransit operators. So my research in a way became a retrospective engagement process to find out what the voice of the paratransit sector would sound like if it was inserted into national public transit policy. The training courses are where we discuss these things. We talk through an issue – say bus operations – and then bring in somebody with expertise from government or the private sector to talk about it. Once the outside specialist is gone, we ask the paratransit operators what it means for them and what potential they see for changing what they do. Barriers are broken down and mutual learning takes place from there. Paratransit operators start understanding why they are legitimate business people who have been running their businesses in very difficult circumstances for decades. Those of us running and presenting the course see that operators are real people who are reasonable and not violent. And everyone is proud to be spearheading something new. What is the main challenge in paratransit research? It is difficult to initiate research amongst paratransit operators so it’s generally a poorly studied field. One of the relevant fields of literature around this is for what’s called “hard to reach research populations”. The comparison is that it is like doing research amongst people with a sensitive medical condition, or addicts, or even drug traffickers because in all cases it is a sensitive topic that operates under the radar. Even though in large parts of South Africa paratransit operator’s businesses are highly regulated, they shy away from and distrust government or other outside entities. You have to meet them face-to-face and gain their trust. That’s a different mode of working than what is typical for transport researchers. Instead of setting up a questionnaire, sending it out, and waiting for responses, it’s more like ethnographic research where you have to go out in the field and related to other people directly. One of the difficulties is that this does not scale up easily. I think that’s why there’s a lot of interest in what apps can do because they can actually scale up. But building direct relationships and trusting relationships with operators is a small-scale thing. Are others doing similar engagement with paratransit operators? There’s huge potential in this field to conduct research and run training programs but one of the big struggles is to find people who want to do it. In many African countries, there are few universities and a small pool of academics. So I see the role of people like me who are in this privileged position in academia to be interpreters. In this case, it’s between paratransit operators and the institutions they belong to on one side, and government on the other. Our role is to be mediators or facilitators in a discussion around change. For instance, at Columbia University, Jackie Klopp’s work is about understanding the relationships, not just between operators and governments, but also between the wealthy world and the developing world. She has built relationships with people at the University of Nairobi and they network with the local residents associations on non-motorized transport, appropriate road design, and paratransit collectives. It’s been successful but also controversial because they’re outsiders who are conducting research in much the way that foreign aid comes to Sub-Saharan Africa. What has been fascinating is a lot of the researchers contacting us are interested in the “Uberization” of non-private car transport in the US and elsewhere and want to know if there are lessons to learn from Sub-Saharan Africa. We’ve also had a visiting PhD student funded by the VREF who was interested in mobility-as-a-service in Australia. He wanted to find out how our minibus services have managed to thrive with little government support. There are groups from elsewhere in Sub-Saharan Africa interested in this idea too. It’s really interesting to see this power dynamic. It’s not just people from developing countries wanting to give; it’s them trying to understand and take away messages because the whole world is changing. The big question they’re all asking is what local innovations they should know about. And there are initiatives spread around the continent. The Digital Matatus project involved mapping all the paratransit routes in Nairobi. There’s an NGO in Maputo that’s mapping and counting paratransit vehicles across the city so you can start matching supply and demand. In Dar es Salaam there’s a BRT consultant trying to bring in cashless fare technology that might be applicable on the daladalas, which is their name for paratransit. In Kampala they’re doing the same and our colleagues in Windhoek are also interested. In Accra there’s a whole bunch of people working on fleet recapitalization. What transportation technology innovations are impacting African paratransit? In the last year or two we’ve seen massive interest in mobile phone technologies. I think they can help, especially in the paratransit sector because it’s an unscheduled service so arrival of the next vehicle on the route can be very unpredictable, especially during off-peak times. Ride hailing capability might improve it. However, even across Africa, the spread of technology is very uneven. In South African cities, half of the population don’t have access to smart phones, can’t afford data, and aren’t yet able to access the full value of the internet. We have incredibly expensive and unreliable internet. On the other hand, Kenya has seen innovations in mobile payments, even in the paratransit sector. So understanding local context is key and we’ve got to think of simple ways to use technology. I want to step back and say that technology is a tool to achieve something but you first need to be clear on what problem you are addressing. Often technology ends up being something looking for a place to happen. There’s a lot of hype in social media about driverless cars. In Kenya, for instance, there’s a very delicately balanced chaos on the roads where people don’t obey official road signs or rules. So I’d say it’s going to be years before a driverless car will be ready for those kind of driving conditions. Tied in with that is the electric car and alternative energy sources. What often drives, or limits, change in our society is cost. Most people are poor and they want the cheapest thing to satisfy their need. Electric battery vehicles are very expensive so it’s no surprise that there are very few around. It seems to me the discourse in the North is around what technology can do for society, which relies on having really good and fast internet and information technology infrastructure. In our case, it’s more about helping people who earn very little – and live in incredibly difficult circumstances – make their living by being able to travel as cheaply and hopefully as safely as possible around our cities. There’s very little commonality between these two discourses. I think our role – as researchers, academics, and activist scholars – is to try to make our voices heard in the Northern discourse. We can help paratransit operators interpret policy and engage government, as well as be a mouthpiece for the sector that’s receiving very little air-time or social media coverage. We can connect with international networks like Meeting of the Minds, ITDP, and activist oriented organizations to spread the message. I think that’s actually more important than trying to find out what is the new biggest best technology. For those of us at universities, our main job should be to directly engage with the needs of the communities around us, and to spread these ideas around the world in more direct ways.